Tuesday, April 4 at 9:30am: We meet with Dennis-Yarmouth Regional High School Students. Wednesday, April 5 at 1:00pm: We welcome the senior community, at the Sandwich Council on Aging, 270 Quaker Meeting House Rd., East Sandwich. (PUBLIC INVITED). Thursday, April. 6 at 10:00am: We meet with Nauset Regional High School students. The Falmouth Jewish Congregation and Cape Cod PATH (People Against Trafficking Humans) will show a short film and present the facts of human trafficking on the Cape. Come for a vegetarian potluck at 5:30 PM. Officials have worked for over six months on a population demographics and housing needs study. Now, they’re about to show the results at a community housing forum. The April 11th event will take place from 6:30 to 8:30 p.m. at the senior center, 150 Rock Harbor Road. Town planning director George Meservey said that officials realize that there are specific sectors of the communities who are in desperate need of housing. It’s April 15th and our taxes are due. What about you, Donald? Trump says it doesn’t matter anymore. We disagree. We must fight back. #taxmarchboston We will protest the fact that he does not release his tax returns, all the while hardworking New Englanders contribute $12 BILLION more in federal taxes than we receive in federal spending. We will not take this anymore. Say goodbye to federal greed, taxation without adequate representation, and federal hypocrisy! From 8 – 10AMat the Optimist Café. The second in our series of Cape Women’s Coalition’s breakfasts for women who are interested in becoming involved in local leadership. 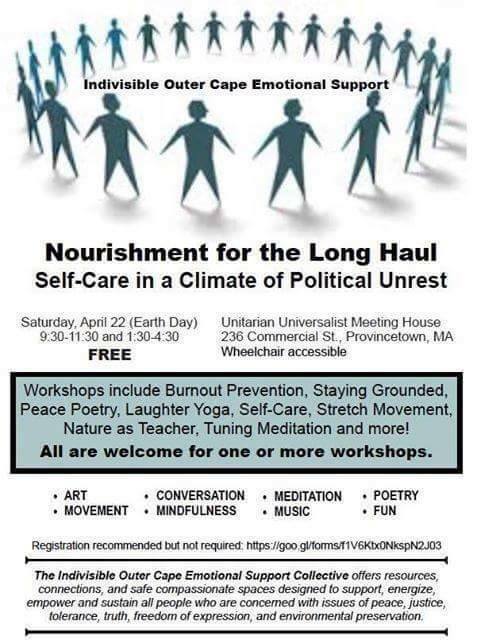 Unitarian Universalist Meeting House, 236 Commercial St. Provincetown, MAThis is a FREE event presented by the Indivisible Outer Cape Emotional Support Collective. Workshops include Burnout Prevention, Staying Grounded, Peace Poetry, Laughter Yoga, Self-Care, Stretch Movement, Nature as Teacher, Tuning Meditation and more! All are welcome for one or more workshops. Wheelchair accessible. Flyer here.